Celtic, Gaul. Senones Tribe. ca. 150 to 50 BC. Date : Last part of the 2nd to first part of the first century BC. Reference : DLT-7417, Sear Greek - 143. Size : 17.2 x 18.2 mm. Weight : 4.43 grams. Grade : F/aVF, with some rough patina on the obverse. Very dark brown patina. Obverse : Stylized head right, with a very course hair style. 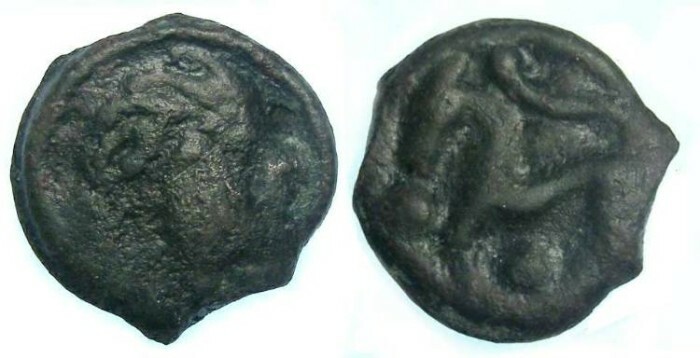 Reverse : Stylized horse left, with two pellets.